mule deer trophies at his home, including antlers believed to be from a well-known deer who lived in the Grand Canyon. FLAGSTAFF, Ariz. – Several state and federal agencies served a search warrant on a man at his Flagstaff home and found mule deer trophies suspected to be illegally hunted. The Arizona Game and Fish Department have been investigating the hunting activities of Loren McReynolds for several years now. Investigators recovered five mule deer trophies at McReynolds’ home, including nontypical antlers believed to be from a well-known deer that lived within the Grand Canyon National Park boundaries, AZGFD said. McReynolds has a previous history of alleged wildlife violations, and was arrested in January 2017 for weapons violations and for killing federally protected burros north of Williams, Ariz., according to AZGFD. McReynolds faces possible jail time and court fines if convicted. In addition, the AZGFD has authority to seek civil restitution for the loss of wildlife to the state and suspend or revoke McReynolds’ hunting privileges. The Arizona Game and Fish Department encourages anyone with information about the illegal take of wildlife to call the Operation Game Thief hotline at 800-352-0700 or visit www.azgfd.com/ogt. A Sacramento County man entered a no contest plea Tuesday to charges of poaching a huge blacktail deer in Sacramento County. John Frederick Kautz, 51, of Lodi, was charged with possession of an illegally poached deer and falsification of deer tag reporting information, both misdemeanors, following a three-month investigation. Poached deer with trophy-sized antlers. December 2017. 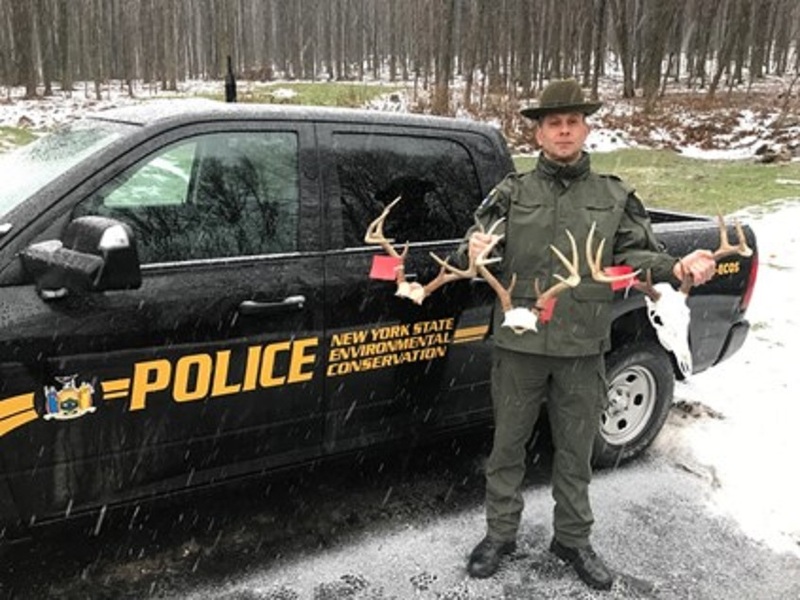 Kautz illegally killed the trophy-sized buck on private property in Wilton in December 2016, two months after the deer season closed in the area. The deer had an antler spread of 31 inches with four antler points on one side and five on the other, which is an unusually large size for this part of California. Kautz transported the illegally killed deer across state lines to Nevada to have the deer head mounted by a taxidermist. Kautz was also working through the process of scoring the trophy class buck to have it entered into the Safari Club International hunting record book. The deer’s trophy-sized antlers would have been surely accepted if the animal had been legally taken. However, the poaching conviction for the buck makes it ineligible for that recognition. Working on a tip provided in September 2017, Wildlife Officers Sean Pirtle and Anthony Marrone spent an exhaustive three months on the investigation, collecting evidence that would prove the year-old incident was an act of poaching. Through extensive interviews, multiple search warrants and forensic analysis of computer records, and with the help of the California Highway Patrol (CHP) Computer Crimes Unit, they slowly pieced together the puzzle. Then, collaborating with Nevada game wardens who conducted multiple follow-up interviews outside of California, they worked together in an attempt to track down the actual deer that had been mounted by the Nevada taxidermist. All California wildlife officers are federally deputized to investigate fish and wildlife crimes anywhere in the United States. The wildlife officers submitted the case to the Sacramento County District Attorney’s office for prosecution. On Dec. 19, Sacramento County Deputy District Attorney David Brown announced a plea bargain resulting in a conviction of two poaching related misdemeanors. Kautz was sentenced to two days in county jail, placed on three years probation with a search and seizure clause, ordered to surrender the mounted deer head and was prohibited by the court from hunting or accompanying anyone else who is hunting during his probation. The fine was set at $5,000 pursuant to a new legislation and regulation package which took effect on July 1, 2017, increasing penalties associated with poaching “trophy class” or very large wild game animals. The vast majority of hunters are ethical and abide by hunting laws and regulations, including the individual who provided this tip that helped lead to Kautz’s conviction. “We would like to thank our wildlife law enforcement partners in Nevada and the CHP, and the Sacramento County District Attorney’s office for their assistance in this investigation and the subsequent prosecution, and the hunter who gave us the original tip,” said David Bess, CDFW Deputy Director and Law Enforcement Division Chief. A new report by Washington state’s Department of Fish and Wildlife has concluded that the growing population of wolves is not hurting populations of deer, elk, moose and bighorn sheep. Dec. 8, 2017, at 3:01 p.m.
SPOKANE, Wash. (AP) — The growing population of wolves in eastern Washington state does not appear to be hurting the populations of deer, elk, moose and bighorn sheep, according to a report issued this week by the state Department of Fish and Wildlife. The agency in 2015-2017 studied the populations of those animals, known as ungulates, that are hunted by wolves and found that none “in this assessment appear to show clear signs of being limited by predation,” the report concluded. Gray wolves were hunted to extinction in Washington in the early 20th century. But the animals started migrating into the state in the early 2000s from Idaho and Canada. The first wolf pack was documented by the department in 2008. At the end of 2016, the state estimated there were a minimum of 115 wolves, 20 packs and 10 successful breeding pairs in the state. All of the documented wolf packs are east of the Cascade Range. The study used population estimates obtained from aerial surveys, plus the number of ungulates harvested by hunters, the agency said. State officials have also launched a more comprehensive, multi-year study of the impact of wolves on ungulates. The agency defined an at-risk ungulate population as one that falls 25 percent below its population objective for two consecutive years, or one in which the harvest decreases by 25 percent below the 10-year average harvest rate for two consecutive years. The report showed that initial fears that wolves would wipe out wild ungulates were unfounded, said Amaroq Weiss, who works on wolf recovery issues for the Center for Biological Diversity, a Tucson, Arizona-based nonprofit group that focuses on protecting endangered species. 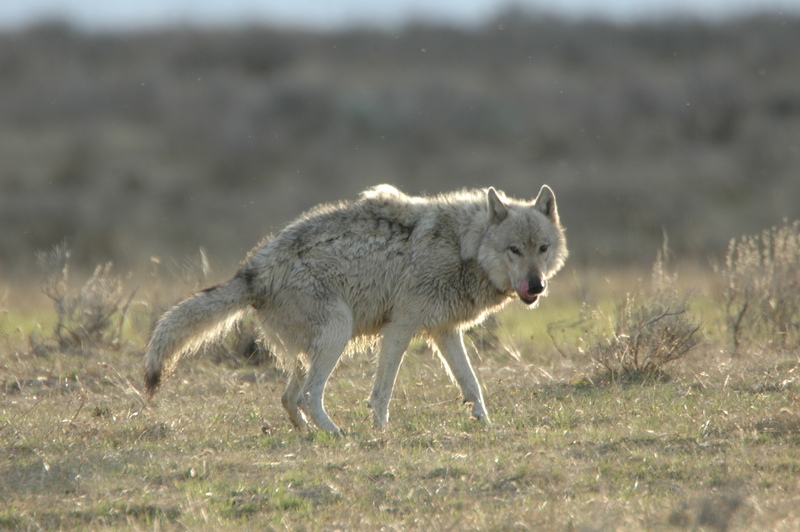 Sarah Ryan, executive vice president of the Washington Cattlemen’s Association, said ranchers support healthy populations of wild animals for wolves to hunt, she said. “We need a robust population of ungulates so wolves will have something to snack on beyond cattle,” Ryan said, adding that she has not seen the study. Washington state’s ungulate populations also include mountain goats and pronghorn, but they don’t usually live where the state’s wolves hunt. Could it all be part of a long-suffering and normally highly (even saintly) tolerant Mother Nature finally fighting back against her one fatal blunder–the fleshy, hairless, upright, arrogant apes armed with their weapons of mass extinction? Homo sapiens may have won countless battles and the arms race hands-down, but Nature will ultimately win the day and eventually, the war, wiping the slate clean for another burst of evolutionary creativity that won’t include the conceited carnivorous primates or their puffed-up fantasies of self-importance. 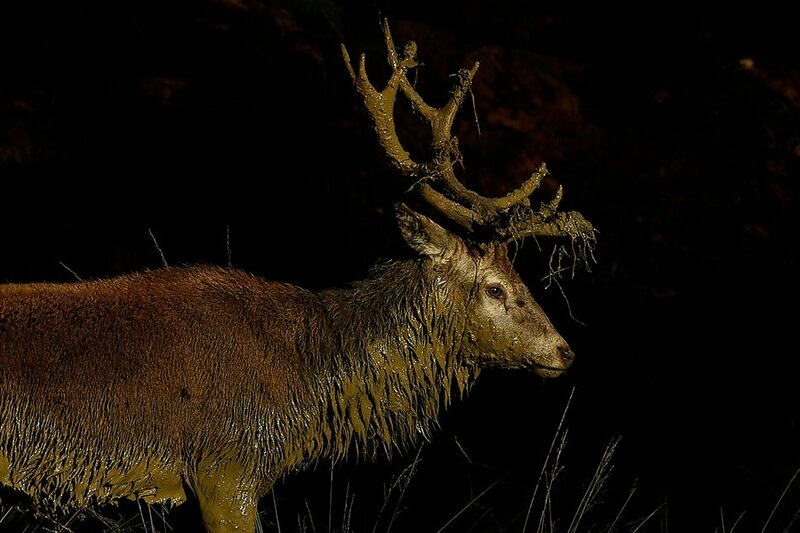 LILLE, France – A 62-year-old man died while taking part in a hunt in the Paris area Monday after being charged by a deer that fatally gored him, police said. The incident occurred around 10 am (0900 GMT) in the Compiegne national park, about 85 kilometers (53 miles) northeast of Paris. The man was acting as a beater when he was struck. 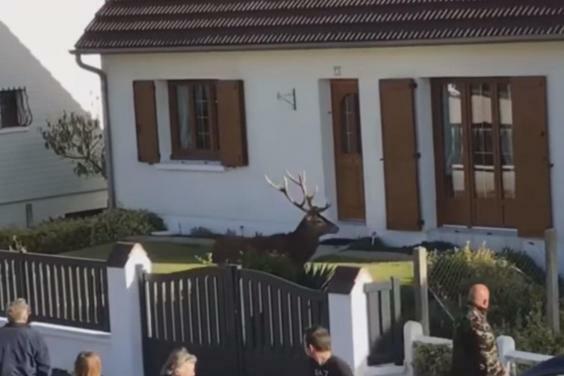 He “was charged and pierced by a deer which stabbed him with his antlers,” a police spokesman said. WISCONSIN The State Assembly passes a bill eliminating Wisconsin’s minimum hunting age. “I think we’re losing sight of why the original law was put into place, it was put into place to protect children,” said Joe Slattery, a concerned parent. Slattery opposes the measure. Right now the minimum age to buy a gun-hunt license is 12 years old, but children as young as 10 can be part of a mentored hunt. This bill removes the minimum age from the mentored hunt program and eliminates the requirement of only one weapon between hunter and mentor. Jordan Schuld is an avid hunter with five kids. He believes parents know their children’s capabilities. “Each parent knows their own child and knows when they’re ready to go out in the woods, if they’re able to hold the gun weight wise and if they’re responsible enough to handle it,” Schuld said. Schuld doesn’t agree with the entire proposal, he still favors a mentor hunt having only one gun. “I just don’t think that there should be two weapons between the parent and the child, I think a mentor hunt is a mentor hunt, and if you have two weapons it’s not a mentor hunt anymore, two people are hunting,” said Schuld. The Wisconsin Hunters’ Rights Coalition says 34 other states have no minimum hunting age, which includes neighboring Michigan. According to the Michigan DNR, studies show if children do not have an interest in an activity before the age of 10, it is unlikely that they will continue that activity later in life. “As a parent, I would like my child to have the same interests as mine, but if they don’t– they’re their own individual,” said Slattery. Slattery says this legislation would lead to more hunting accidents, like the one that took the life of his son. “You can get them involved at six, by taking them hunting with you, that’s perfectly legal right now, you just don’t have to put a gun in their hands, my son was killed at the hands of another 13-year-old,” said Slattery. “If one my kids seem ready and they’re under 10, I’ll absolutely take them hunting, if not, I’ll wait,” said Schuld. The State Senate is expected to vote on the measure next week, if passed there it would head to the Governor’s desk for his signature. The Maryland Natural Resources Police arrested five Garrett County men for deer poaching activities, which stemmed back as far as 2016. Public tips and social media posts prompted an investigation into a string of illegal hunting incidents. Homes in Garrett County were served search warrants in July, before charges were filed against the five suspects. Twenty-nine-year-old Dakota Lee Hinebaugh, of Oakland, was fined for 24 hunting violations. He faces up to $39,500 in fines and loss of hunting privileges for up to five years, police said. He allegedly hunted without a license and during a closed season, as well as possessed a deer during a closed season. Hinebaugh is accused of hunting deer at night without written permission, with a spotlight and hiding a deer or removing the head before check-in, according to police. Twenty-one-year-old Michael DeWitt, of Swanton, was fined for a total of 30 violations. He faces maximum fines up to $45,500 and loss of his hunting privileges for up to five years, police said. DeWitt allegedly hunted during and possessed a deer in a closed season. He is also accused of firing his gun from a vehicle, hunting deer with a spotlight, hunting without written permission, failing to return a turkey kill, obstructing a police investigation and hiding a deer or removing a deer’s head before check-in. Forty-two-year-old Michael Allen DeWitt, of Oakland, was charged with littering and hindering or obstructing a police investigation. He faces a 30-day jail sentence and a maximum fine of $1,500. 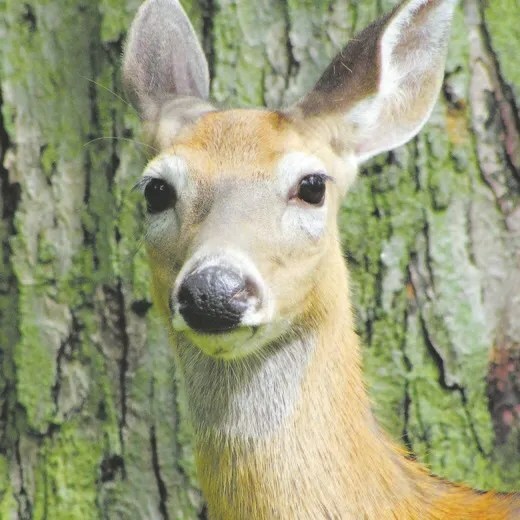 Forty-one-year-old Donald Lee Hinebaugh, of Oakland, was fined for aiding and abetting hunting without a licensed and failing to report two deer kills, police said. He faces a maximum five of $1,500. Fifty-eight-year-old Phillip Lyle DeWitt, of Mount Lake Park, was fined for “failing to report a kill and failing to record the kill on his Big Game Harvest Record,” police said. He faces a maximum fine of $3,000. Additionally, the Maryland State Police charged 19-year-old James Wesley Lewis, of Accident and 18-year-old Lukas Issac Holler, of Oakland, for possession of a shotgun or rifle and illegal ammunition after conviction of a disqualifying crime. Both men face a maximum three-year prison sentence and maximum $1,000 fine. They also face an additional one-year prison sentence and maximum fine of $1,000 for the ammunition charge. 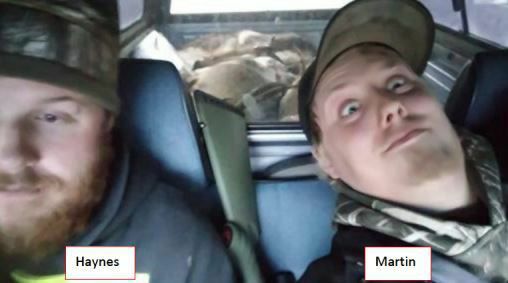 William Haynes, left, and Erik Martin pose for a selfie in Haynes’ pickup truck. The image was sent from Martin to his girlfriend on November 19, 2016, according to case reports. In the back of the vehicle, multiple deer can be seen. According to case reports, the deer were illegally killed in Oregon and transported across state lines to Washington. For individuals who apparently got a thrill by stalking and illegally killing wild animals, William J. Haynes and Erik Christian Martin did a poor job of covering their own tracks. The suspected poachers unwittingly provided law enforcement officers with a huge cache of evidence, allowing Washington Department of Fish and Wildlife investigators to build a massive case against them and five other members of an alleged poaching group. Based on case reports reviewed by The Daily News, there’s little sign the men ever thought about getting caught. Instead, the 23-year-old Longview residents are suspects in an investigation into the killing of more than 50 animals including deer, elk, bears and bobcats in two different states. Along the way, they left a digital trail of shocking evidence for Fish and Wildlife investigators to follow. The painstaking task required two Fish and Wildlife officers and a sergeant, who spent a majority of the past winter and early spring diligently retracing the suspects’ bloody steps. Investigators were also assisted by more than 30 officers from multiple agencies, including the Cowlitz County Sheriff’s Office. “We’ve used a lot of our manpower in this region in Western Washington to accomplish this case,” Fish and Wildlife Sergeant Brad Rhoden said in an interview. Rhoden said he doesn’t want intense interest in the case to lead to a negative perception of honest hunters. Haynes is facing 61 separate charges in Skamania County District Court, including 26 charges of first-degree illegal hunting of big game. All of the charges are related to the use of dogs while hunting, which is illegal in Washington without a special permit that’s only granted in specific instances. Haynes was previously convicted of second-degree unlawful hunting of big game in Cowlitz County on Oct. 3, 2013. As a result, all of Haynes’ big game charges could be considered Class C felonies, which are punishable by up to five years in jail and a $10,000 fine. Martin, who does not have any previous violations, is facing 28 separate charges for gross misdemeanors. In addition to Haynes and Martin, three other suspects have been named in the investigation. They are Joseph Allen Dills, 30, of Longview; Eddy Alvin Dills, 57, of Longview; and Bryan Christopher Tretiak, 31, of Morton. All of the suspects are awaiting preliminary appearance hearings in Skamania County later this month. Two female suspects were named in the case reports but no charges have been filed against them yet. Dills, who has bear claws and dog paws tattooed on his left arm, pleaded guilty in Wahkiakum County District Court in 2008 to second-degree unlawful hunting of big game and second-degree criminal trespassing. He’s now facing 64 separate charges, including four first-degree unlawful big game hunting charges for the illegal use of dogs. Had Haynes and Martin known that the contents of their phones would result in so many charges, it’s possible they may have opted not to document such a staggering number of alleged illegal hunting activities. Based on case reports, it’s not clear if Haynes or Martin thought twice before agreeing to allow two Oregon State police officers to look through their devices on December 3, 2016. According to reports, the troopers had stopped the men after recognizing Haynes’ Toyota pickup as the same vehicle that appeared in several images captured by Oregon Department of Fish and Wildlife game cameras. The motion-activated cameras were set up in response to past illegal big game hunting activity in the Mount Hood National Forest during the months of November and December. Upon questioning, Haynes and Martin confessed to illegally killing two buck deer and a silver gray squirrel, according to reports. The two men admitted to taking only the heads of the two deer and the entire squirrel back to a house in Longview, leaving the rest of the animals to rot. At this point, Senior Trooper Craig Gunderson requested that Washington Fish and Wildlife Sergeant Brad Rhoden assist with recovering the illegally transported deer heads. When Rhoden arrived, Gunderson informed him that Haynes and Martin had consented to having their cell phones searched. According to reports, it was at this point that the true scale of the ensuing investigation began to emerge. An initial look through the devices revealed numerous photos of antlered deer skulls, dead bull elk, and — perhaps most disturbing — bear hunting with the use of dogs. Gunderson seized the phones as evidence and obtained a search warrant to have a forensic analysis performed on the devices. On Dec. 16, 2016, Rhoden met with Gunderson and several other officers to transfer evidence from the analysis. The contents of Haynes’ phone provided hundreds of photos and videos documenting a pattern of brutal killings on more than 20 separate occasions. In some cases, bears were still alive as Dills’ dogs gnawed on their flesh, Rhoden said. Martin’s phone also held numerous photos and videos of the unlawful harvest of big game. In addition to incriminating photos, videos and text messages, the evidence included crucial metadata which allowed investigators to pinpoint exactly where the illegal killings occurred using GPS coordinates. Investigators could not have retraced the suspects’ steps if Haynes had not granted his phone’s camera permission to access its GPS location data. “What was most difficult about this case is that we had to pore through so many records,” Rhoden said.